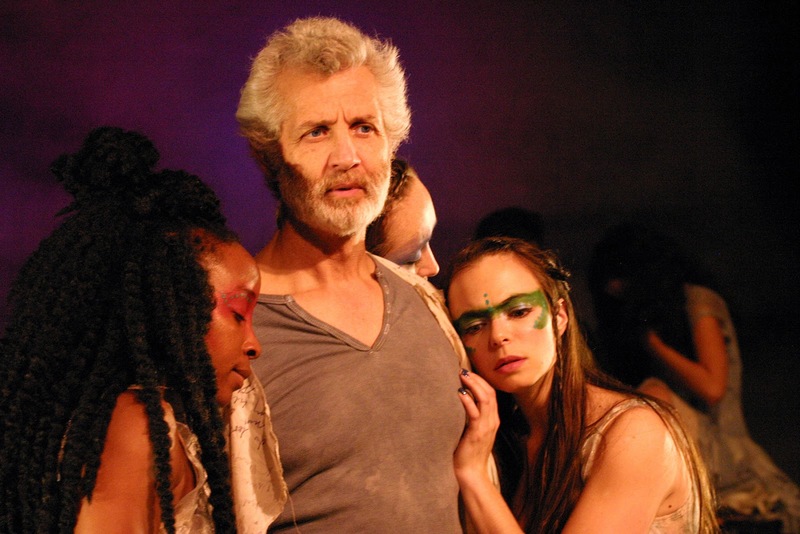 Tempest Redux is a re-imagining of one of Shakespeare's last plays (many believe Prospero is a stand-in for the Bard himself). For the most part, this re-imagining consists of a careful edit, streamlining the show with considerable skill. At least that takes up the most time in terms of changes. But so much more awaits those who see this production. Allow me to admit (as before) that as an audience member I'm very stingy when it comes to standing ovations. Many the time, after a very good performance, my applause has been sincere and long, yet my seat remained occupied while others rose. Just quality alone does not deserve a standing ovation. My standard for such is when I feel genuinely changed by a performance, when my world is rocked in a way and on so many levels the world itself seems a different place. Easily can I name really fantastic, wonderful, even trascendent works of theatre for which I did not rise. Yeah, I'm tough that way. For Tempest Redux, I could not help but rise to my feet. In awe and gratitude, at the same time needing some time to recover from the power of this show. I'll get to final revelation that felt like a slice into my soul in a little bit, but first -- the production overall. Shakespeare's plays have the fantastic power of allowing all kinds of styles and methods to tell their tale. 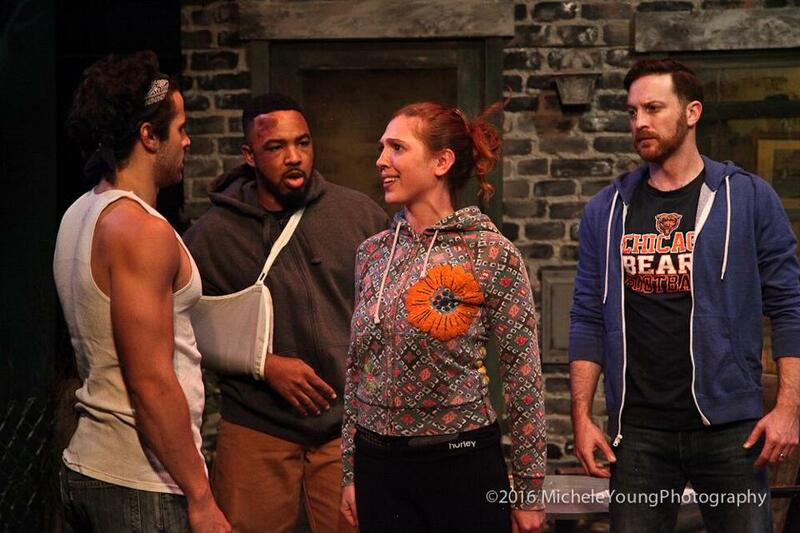 This one, arising from the Odyssey Theatre Ensemble and the New American Theatre, startles in many ways. One is its physicality, including having no less than three actors (Shea Donovan, Briana Price, Emily Yetter) simultaneously portray Ariel, lipsyncing recorded words in a kind of dance with sound and movement and even lights. Likewise two actor together (Dash Pepin, William Long) were together Caliban, often entwined, sometimes hand-in-hand, or moving in complete unison. The effect proved dazzling, even magical, and appropriate for the non-human characters. Kudos to the entire cast, actually, up to and including Mimi Davila as a feisty, kind, obedient and unafraid Miranda (just think about trying to convey all of those qualities at the same time). Charles Hunter Paul likewise proved a refreshingly believable young prince, one capable of seeing in this strange girl all his heart might desire. Arguably these are the two most difficult roles in the play (much like Hero and Claudio in Much Ado About Nothing). 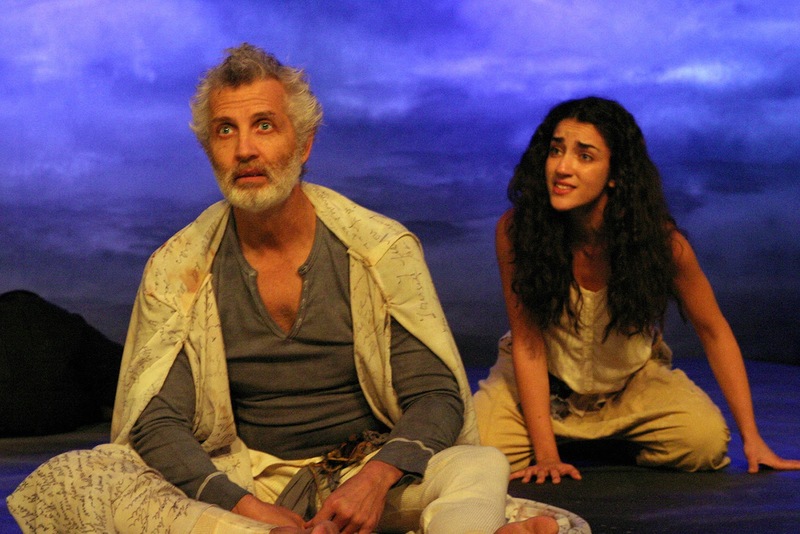 Dennis Gersten likewise did wonders as Antonio, faithless brother to Prospero, as well as the cook Trinculo. Gildart Jackson shone in his double role as well--a grieving and sincere King Alonso, and as the delightfully supercillious Stephano, drunken butler to His Majesty (and would-be God King to the simple-minded Caliban). But the star of any Tempest needs must be Prospero (Jack Stehlin), the aging father, exiled Duke, and powerful sorcerer. Here lies the most startling and vivid performance of all, which frankly took some doing! But then, this is the part to do it with. We halfway expect to see Prospero as a version of Gandalf from Lord of the Rings or maybe Dumbledore from Harry Potter. No. Here we meet a dying old man, one distracted by his musings and full of sorrows, but also capable of the most tender emotions imaginable. Indeed, at times he seems overwhelmed by his own heart, while increasingly surprised by events. And here we get to the gut-wrenching spoiler. Outline the next paragraph is you want to learn it. You might prefer to wait and see the show. Nothing we see is real, or very nearly nothing. Prospero's loneliness and tragedy have driven him mad, until at last waking dreams of a sublimely happy ending take form. I myself suspect Ariel is real, and has faithfully created these illusions for her Master all these years, and as he sets her free at last, harsh reality closes in. Prospero is wise, and good. We long for that happy ending this man deserves so very very much -- and in the end he has nothing but his wandering wits, and a tiny skeleton of the daughter who of course did not survive. 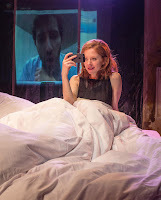 "Now all our revels are ended..."
I had the great good fortune to speak with the director/adaptor of this play, John Famanesh-Bocca, and can only say I will eagerly attend any show of his in the future. Just as I felt honored to meet the cast and tell them individually this was indeed the best version of The Tempest I have ever seen. 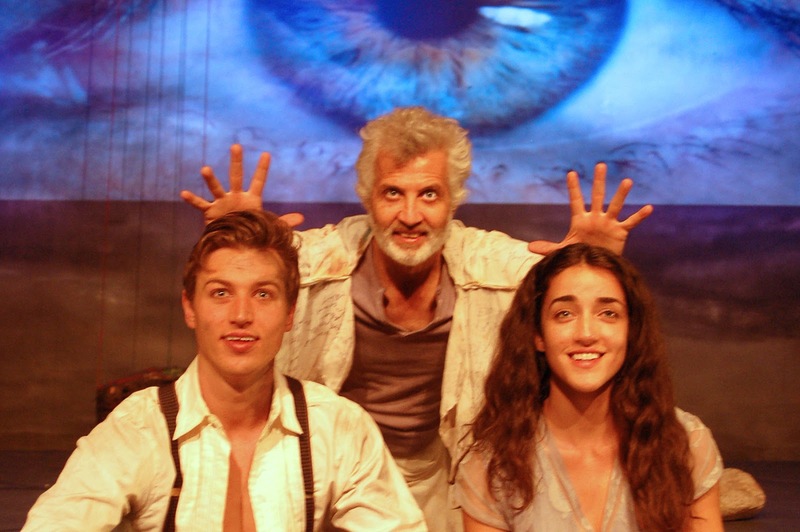 Tempest Redux plays at the Odyssey Theatre at 2055 South Sepulveda Boulevard Los Angeles, CA. 90025 until April 10, 2016 Fridays and Saturdays at 8pm, Sundays at 2pm. NOTE: THIS SHOW HAD BEEN EXTENDED. 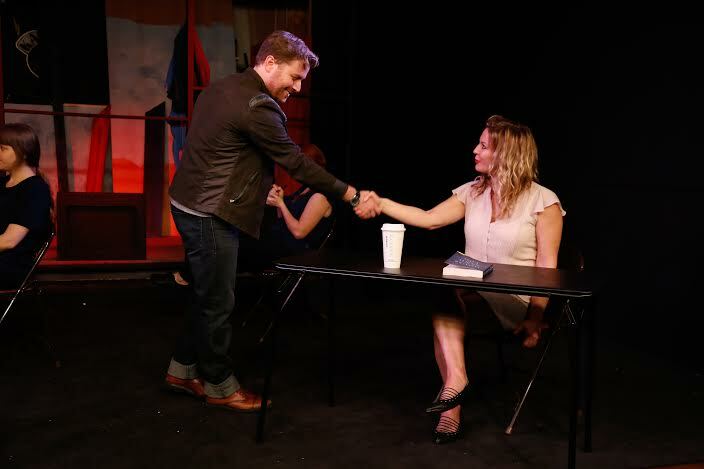 Only The Moon Howls by Dean Farell Fuggerman marks the latest production of Theatre Unleashed in North Hollywood. Directed by Eric Cire, it turns out to be an incredibly precise work, and in rather a lot of ways. For one thing, here is a play that knows it is a play. In the modern era--partially fed by t.v. and motion pictures--we tend to expect plays in a "naturalistic' mode. We the audience fulfill the role of eavesdroppers on what pretends to be real life. Not so here. Incidentally, up until the 19th century that was normal for theatre--no concept of the fourth wall, overtly non-realistic style so taken for granted no one ever thought of it in those terms, details even of history reshaped for dramatic purposes. In fact so called "naturalistic' theatre is the same, just more subtle about it. 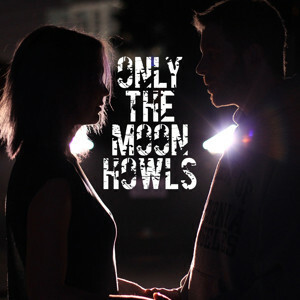 Only The Moon Howls focuses upon a married couple, upon their relationship as re-created and commented upon by a chorus of four, who speak not only to the audience but also to the characters. Indeed, one of the romantic pair Whitney (played on various nights by Kate Dyler or Julia Plostnicks) argues with the Guides (Margaret Glaccum, Sammi Lappin, Madeleine Miller, Graydon Schlicthter, Eric Stachura) about how they're telling the story! No, that isn't how our first conversation went! What do you mean this version of 'our' song makes more thematic sense for the moment? Wait! What about our dogs? She's not wrong. But of course she's also missing the point. They have an hour. Even hitting the highlights in that hour cannot but be a daunting task. More, as we rapidly realize, this love story ended with no real closure. How could it, under the circumstances. Whitney's husband Jake (Carey Matthews and Michael Lutheran) is a writer, hoping quite literally to create the Great American Novel. He does get stuff published now and then, but is mostly a stay-at-home husband, given to moping about the decision made--too quickly, he comes to believe--of not having children. A dreamer, he ignores (we're told) how much he actually disliked (note the tense) noise and mess. Or maybe he would have changed, would have happily paid that price in the end. Or perhaps he's looking for some excuse for the life he doesn't have. It could easily be both. As for Whitney, she loves Jake as he loves her. She rises to the Head of Human Resources for a major corporation, but the strain of what seems missing in their lives impacts her job. Her boss is not really sympathetic. Not at all. How might they have resolved such issues? We will not--cannot--know any more than they. Such is the nature of their tragedy. In a way, that harkens to the kind of play this turns out to be--a classical Tragedy. A.R.Gurney in his play Another Antigone has a classics professor make a vital point about Classic Tragedy, as in the works of Sophocles. The Ancient Greeks did not really see Tragedy as (for example) Shakespeare did, learning about wrong choices. Instead they focused on the sadness and disaster in life about which we can do nothing. To love must mean to leave oneself open to being hurt. Expectation leads to disappointment, at least sometimes. Beginnings cannot exist without endings. Desire contains within it loss. Facing that may be the most human thing we do. Bees have language. Beavers build damns. Ants have war. Dogs feel love. Even spiders create what certainly seems like art. Our species alone endures a sense of tragedy, because we know we're going to die. I am quite a fan of Theatre Unleashed, and count this production among their best--not only because of the subject matter but because the cast and crew united to make it all work. A script is a blueprint, the playwright a collaborator. Mr. Bruggerman was very fortunate in having this group working with him on bringing those words off the page. Only The Moon Howls plays Thursdays, Fridays and Saturdays at 8pm (with special performances on Mondays February 29 and March 7) at the Belfry Stage, upstairs at 11031 Camarillo Street, North Hollywood CA 91601. For more information call (818) 849-4039. For the sake of honesty, let me note couple of the members of the cast of Broken Fences are friends. I'm also a fan of several other cast members. I'm not familiar with the playwright, Steven Simoncic, nor director Andre Barron, and have only seen a reading or two at the Road Theatre Company before now. The story as written reminded me of those "well made plays" of the 1950s and 1960s, albeit with an edgier more modern sensibility. A young white couple expecting their first baby, can afford to buy a house in an area once pretty much a ghetto but now changing. 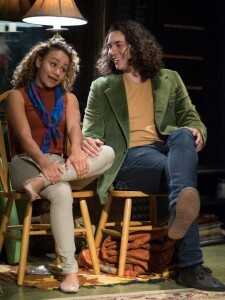 The play focuses on this couple, along with some of their friends, in contrast to the family next door--one who've called this area home for generations. Home. That idea pervades the story and characters. The search for a home, the fierce desire to preserve one, the tricky act of defining just what makes a home, plus the equally tricky question of what one does with it. Do you set down roots? Build a castle wall? Leave to find/create a new home? One thing in particular seems most impressive about the play--that it never suggests some neat answer. Like life, such rarely exists. We do the best we can. This follow through even to the last moments, where Simoncic showed the great skill to allow events to give us the stopping point rather than words. The stopping point, not the end. Again, like life, doesn't seem like there really is an end. Czar (Coronado Romero) and April (Mia Fraboni) begin this part of the story, moving in amidst hopes and a lot of intellectualized good will. They even look down a tiny bit at their friends Spence (Kris Frost) and Barb (Ivy Khan) who come along to help but clearly feel nervous in 'the hood.' Soon they come across Esto (Ben Theobald), friend of their new next-door-neighbors, who is calmly stealing from their moving van. When the neighbor--Hoody (Bruce A. Lemon) and his fiancee D (Donna Simone Johnson)--show up, the air grows thick with awkwardness, although Hoody makes sure Esto backs off. Adding to all this is Hoody's brother Marz (James Holloway), and the issues they have about home, family, obligation, etc. 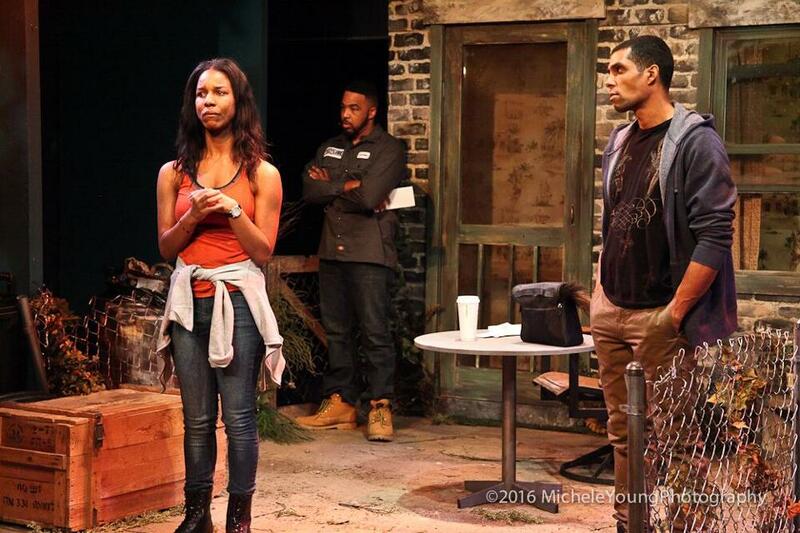 Amid the characters, who all the while manage to avoid stereotype while partaking of many details of which stereotypes are made, what ultimately moved me most was when the play veered away from what we like to call "reality." When characters broke the fourth wall and spoke to us, the audience, outside of any specific time and place, that was when I found myself most entranced. But please note the word "most." Plenty of lovely moments and details shone through, times when uncomfortable (and sometimes startlingly hopeful) truths reared their heads. This makes for some very good theatre! More, the overall quality of the entire cast (often not the case, let us be honest) steps up the whole production a notch or two at least. Broken Fences by the Road Theatre Company plays the Noho Senior Arts Colony, 10747 Magnolia Blvd, North Hollywood CA 91601 Fridays and Saturdays at 8pm, Sundays at 2pm through April 3, 2016. 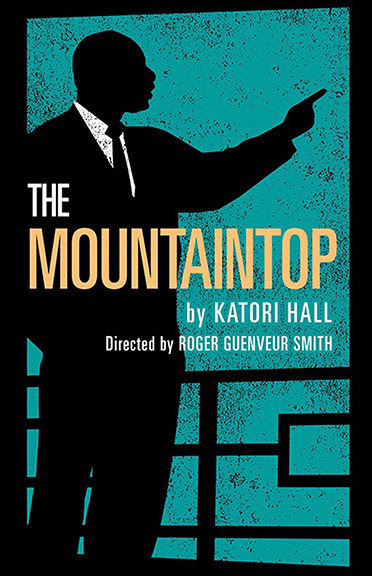 When reading about Katori Hall's The Mountaintop at the Matrix Theatre Company on Melrose, my initial impression was positive, but (as it turned out) a tad misleading. The idea seemed straightforward enough. 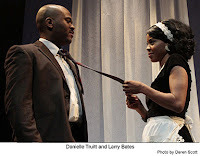 The play tells of the last night spent by Dr. Martin Luther King Jr., in the Memphis Tennessee hotel room where he slept, and a conversation he had with a maid. Sounded interesting--the famous man, in the midst of the very society-shaking movement which lifted him to fame, in a private talk with a working young woman on whose behalf he in theory has been working. Lots of potential there! The famous discusses life with the unknown, the ordinary. A man hearing reactions from a woman. An ideal confronted with the most mundane and practical. I was hopeful of insight coupled with emotional impact. For the record, that was the least of what I got. Starting with the scenic design by John Iocovelli, a bare white space with a few specific pieces of (also white) furniture, I got the impression of something not-really-naturalistic. At first, I simply took this as a means of filling up the stage space and also focusing on the skin tones of the two member cast. Well, that certainly seems true, but then before the action started the tiny period t.v. set showed a race. Immediately, my thoughts went to the 1936 Olympics in Berlin, but it didn't look right. Wrong period. The quality of the film didn't match. Then when Dr. King (Larry Bates) first appears, we see only his shadow. Soon enough, the attractive maid named "Camae" arrives (Danielle Truitt), bringing the Reverend his late night cup of coffee. The two begin to chat, to flirt, to share a cigarette and to talk about...well, life. Each discusses the issues of the day, how they approach their respective jobs, what each thinks of the other as well as what each thinks the other thinks. But then, in a stressful moment, Camae refers to Dr. King by his given name "Michael." Hardly anyone knows this fact, and the somewhat paranoid man (with good reason--we know the FBI followed him, treated him as a domestic enemy for stirring the pot and demanding social change) reacts as if he's discovered a spy. Then...he finds out he's wrong. Camae is not a spy. She's not even a maid. Instead she's a young woman murdered just a night or two before, sent by God to usher Dr. King into the next life. His time has almost come, and God wants him ready. Camae is an angel--one in awe of King. Because even now she cannot forgive the white man, while he has. Despite all his faults--including the fairly industrial strength flirting, plus a demand to speak with God to try and talk his way out of this--King yet stands ready to forgive. What, Camae asked at one point, do white people and black people have in common. "They're both afraid," he answered. King wants to stay. Wants desperately to make things right for the things he's done wrong, but more wants so very much to see his people to the promised land. He has dropped the baton sometimes, he admits, but he's always picked it up again. But God's message is clear--time to pass that baton on. His part of the race is done. 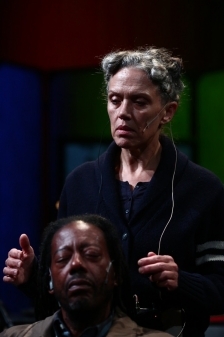 What perhaps makes all this most powerful--other than the rock-steady performances of the cast--is how the play ends, as King gets a glimpse of the future. The baton goes on being passed, he learns, amidst all the good and all the bad, the advances and setbacks, the triumphs and tragedies. We share his vision, not a linear history nor some set of questions answered, but kaleidoscope of images and sounds while Camae utters what sounds like prophecy--what will be, and what must be. Pass the baton. When it falls, pick it up. And again. And again. And again. Amen. So the reluctant martyr faces his fate. "Will it hurt" he asks? "You won't suffer," she answers. "The whole world will cry, though." The Mountaintop plays at the Matrix Theatre, 7657 Melrose Ave, Los Angeles, CA 90046 on Saturdays at 8pm, on Sundays at both 3pm and 8pm through April 10, 2016. Next weekend I'm conducing an acting workshop focusing on Shakespeare. For those of you who don't know, I have a BA in Theatre Arts and graduated the (now sadly no more) National Shakespeare Conservatory in NYC. Among the roles I've played are Jacques in As You Like It, the Fool in King Lear and Malvolio in Twelfth Night as well as a host of characters in an experimental production Off Off Broadway of Macbeth. 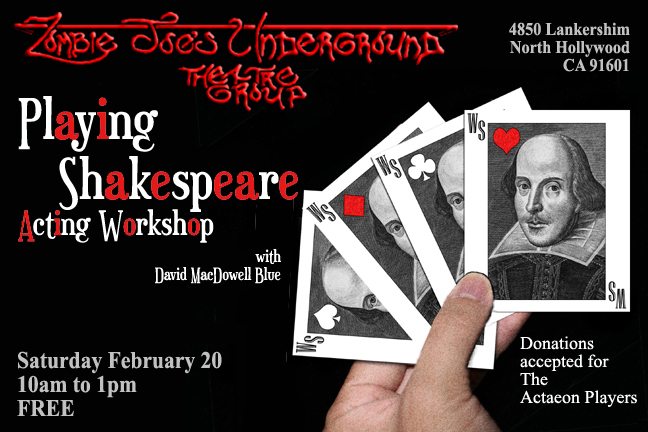 I've directed plays and run workshops before--this one focusing on the fun of playing Shakespeare. Folks think his works difficult and hard work, but in fact once you learn a few simple things they are enormous fun! So come on Saturday, February 20 from 10am to 1pm for Free at Zombie Joes Theatre Group, 4850 Lankershim Blvd (just south of the NoHo Sign), North Hollywood. Donations accepted on behalf of the Actaeon Players. I'll also hold a raffle to give away one free ticket to that evening's performance of Tempest Redux at the Odyssey. Okay, this is the kind of show I tend not to like. At all. The whole "look how messed up this person is" all too often comes across as self-indulgent and (worse) boring. Mostly due to generic issues explored in timid ways with neat solutions of one kind or another. At best one can sometimes see this explored in a vastly entertaining manner, usually comedy. 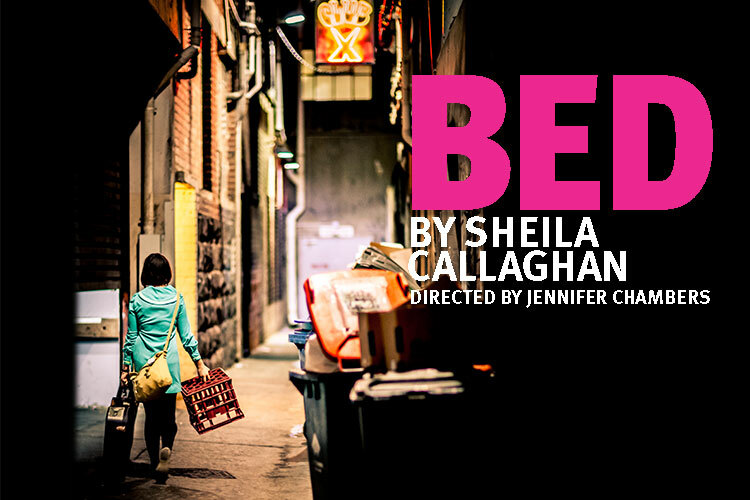 Then there's BED, by Sheila Callaghan and directed by Jennifer Chambers, staged by the Echo Theatre Company in Atwater Village. I got a very nice press packet accompanying this play, but I'm not going to reference it. No, instead I want to focus totally upon my experience as an audience member. As my initial paragraph hinted, my expectations weren't high. A ten year relationship told in scenes with the characters in bed together. Sounds like a racier version of many a play I've seen in community theatres to be honest. But I said to myself--c'mon this is the Echo! Yeah I have a high opinion of this company. A high opinion based on productions like this. BED has characters who defy the words (and concepts) "generic" or "formula." 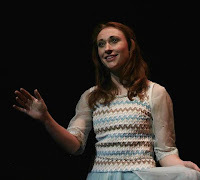 Yes, we meet two people the night they spend together for the first time--Holly (Kate Morgan Chadwick) who seems a Dionysian rebel and Cliff (TW Leshner) a Romantic Apollonian if ever one breathed. Yet they confounded expectations, even though this seeming-formula is something a staple. But the contradictions almost immediately began to pile up. No, not contradictions. A better word is paradox. Because therein lies the heart of what we see in real human beings, genuinely fascinating characters. 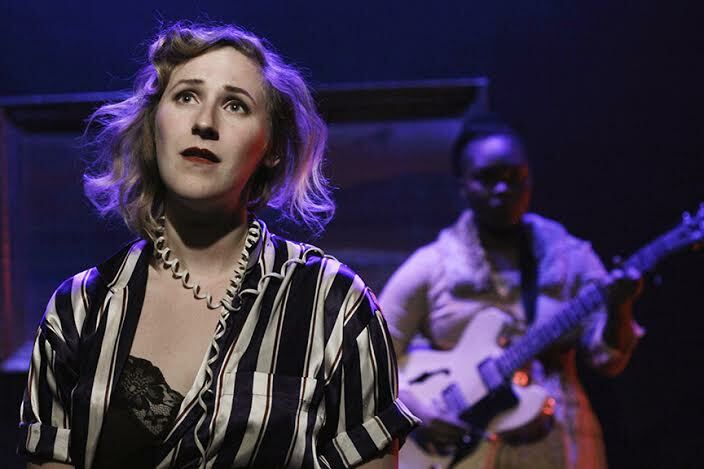 Holly is so nihilistic, yet accepts a marriage proposal with hardly any resistance--issuing a warning that hangs over the rest of the play. Likewise Cliff seems like such a rock of stability. He is not. He tries so very hard to make things right, to adapt, to support. In truth a part of him changes with the wind, and he cannot seem to find his way. Except, he doesn't dissolve into uselessness and impotence. Rather, he grows into a subtle and strange courage. Holly turns out to be a fantastic mother, despite her disdain of children. Still, her fire burns (in part maybe to try and sear away a bit of venom in her soul--the hints of which are chilling). Adding to all this the play eschews strict naturalism, not content with the bed (and yeah, character names) as a metaphor but with the metaphors piling up and up. The final scene becomes totally surreal, as this couple do not (as we would expect) break up but instead enter into a new level together. A strange, disturbing, as-yet-unexplored place seemingly full of danger and hope. 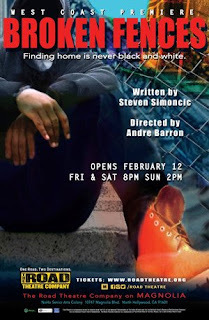 None of which would work if the cast (including Johanathan McClain as JC, Cliff's brother), director, designers etc. didn't do their jobs! The major point I want to make is how nobody seemed to hold back. The commitment of everyone to explore this story, these people pushed a good (even excellent) script into something uniquely powerful in its own right. BED plays at the Echo Theatre 3269 Casitas Ave, Los Angeles, CA 90039 Fridays and Saturdays at 8pm and Sundays at 4pm and 7pm, until March 13, 2016. Followers of my blog probably realize I see nearly everything produced by Zombie Joe's Underground Theatre Group. I'm proud to say several folks associated with this theatre call me friend. But I try my best to be objective. 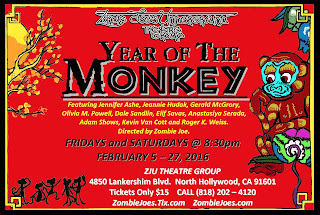 This show, Year of the Monkey, however comes across as something deeply personal--a kind of theatrical Happy New Year card from ZJU to their audience. (For the record, Chinese astrology recognizes not only the 12 totems of the years, but also their association with five chinese elements--earth, air, fire, water and wood. 2016 is the year of the Fire Monkey). It comes across as another example of what I call "theatre of dreams" at which ZJU tends to excel. There is something resembling a plot--the triumph of the monkeys over the tyranny of the passing Dragon (2015 was year of the dragon). But in the hour-long show the cast of monkeys really take us on a journey/quest exploring what monkeys are, what monkeys do, what monkeys want. And in case you haven't guessed ye, we are the monkeys. 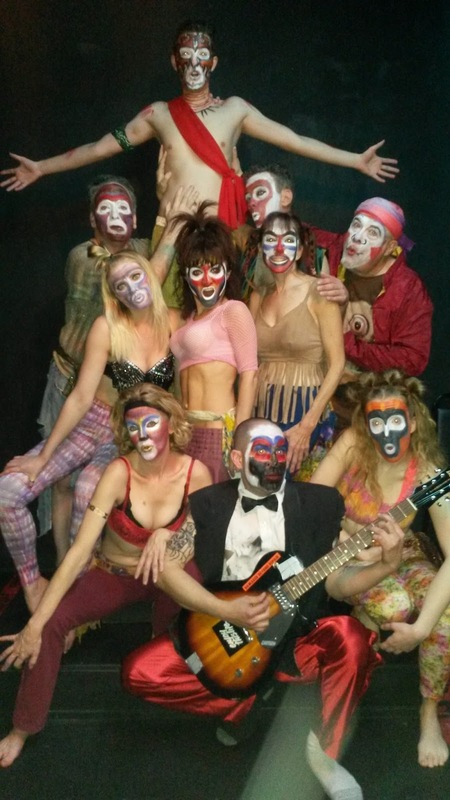 So with music and dance, song and pantomime, the monkey tribe celebrates itself and seeks to over come the Dragon. They lack the raw power, the ferocity of their adversary--whom the cast becomes as they do everything else in the show. But they try--and fail. Then try again, to fail again. But the cycle declares that eventually they will find a way--a way for monkeys to win (and therein lies the secret of their success--trying to be a dragon cannot help but fail, after all). If this sounds weird, you're not wrong. But make no mistake, the show is also very fun indeed. Not just fun but at times tragic, moving, always startling and yet quietly logical according the logic of dreams. Heroes die, devoured by a monster, only to be resurrected to help fight again. Terror gives way to comfort, ritual to courage, experience to insight and wisdom. From thence, comes victory. Kudos to the entire ensemble, including several ZJU regulars: Jennifer Ashe, Jeannie Hudak, Gerald McGrory, Olivia M Powell, Dale Sandlin, Elif Savas, Anastasia Serada, Adam Shows, Kevin Van Cott and Roger D. Weiss. Their performances hint they had a blast putting this show together--and it shows, even overflowing into the audience. 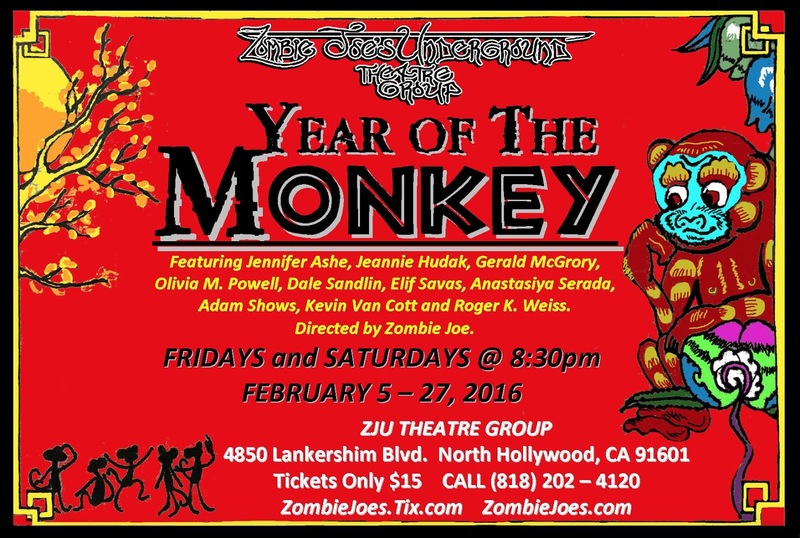 Year of the Monkey plays Fridays and Saturdays at 8:30pm until February 27, 2016 at ZJU 4850 Lankershim Blvd (just south of the NoHo sign) North Hollywood CA 91601. You can get reservations by calling (818) 202-4120. Initially I was going to write an elaborate kinda/sorta not-quite-review of this production by the esteemed Wooster Group of Harold Pinter's first major play, The Room. Samuel French, the play publisher, issued a strange demand regarding this production, evidently as a result of some feedback from the Pinter estate. Maybe. We don't really know. Their demand, weirdly enough, was that the show get no reviews. Well, it really isn't up to Samuel French (nor the Wooster Group, nor the REDCAT theater where the show plays) to make that call. Now that Samuel French has refused to authorize an extension of this production, it hardly matters. So here is my unabashed reaction. Pinter rightly won a reputation as one of the English language's premiere playwrights of his era, the master of what some dubbed the "comedy of menace." The Room pretty much encapsulates this. A man and woman in a room they evidently rent putter about, chatting about pretty much nothing. Well, the woman does. The man remains resolutely silent. His wife(?) seems a pack of nerves, but fiercely trying to hide it by what might be called "reassuring" talk about how comfortable they are. Yet she's also afraid--overtly of the room below, evidently recently vacated. What precisely anyone in the play is afraid of, or what makes them angry (or worried, cautious, excited, etc.) remains unstated and unexplained--deliberately so. Hence the menace, all the more vivid given the period in which the play first appeared, the 1950s when success and conformity were treated as gods. Herein lies a bit of problem, which director Elizabeth LeCompte approached with an intriguing slant. We live in a world two generations past that of the play, one post 9/11 as well as the Cold War and dozens of other perception-altering events. How then, make The Room as vivid as in the past? This production did not change the play as one might think from Samuel French's reaction. Rather it dove a bit deeper into the text, adding the occasional stylistic flourish. Stage directions, for example, were read aloud even as the cast performed them. The sound effects emerged not from a sound booth out of sight, but from technicians on stage. Instead of a traditional box set, we got a rather Eastern approach to the acting area. A few lines were even sung! So what we the audience experienced hardly resembled that audiences saw previously--yet remained utterly the same text, focusing upon the same issues and ideas, seeking to invoke the same emotions. Not sure it completely succeeds, at least not directly. 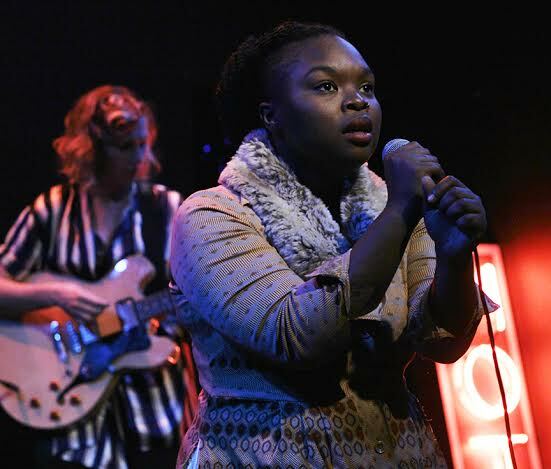 What this production and cast (including Kate Valk, Scott Renderer, Ari Fliakos, Suzy Roche and Philip Moore) did accomplish was forcing me to look at the play anew. In fact, getting it out of my mind has proven a tiny bit of a challenge. Honestly, for that alone they deserve plenty of applause! The Room plays at the REDCAT in the Disney Center downtown 631 West 2nd Street, Los Angeles at 8:30pm until Saturday February 13 then at 3pm on Sunday February 14. 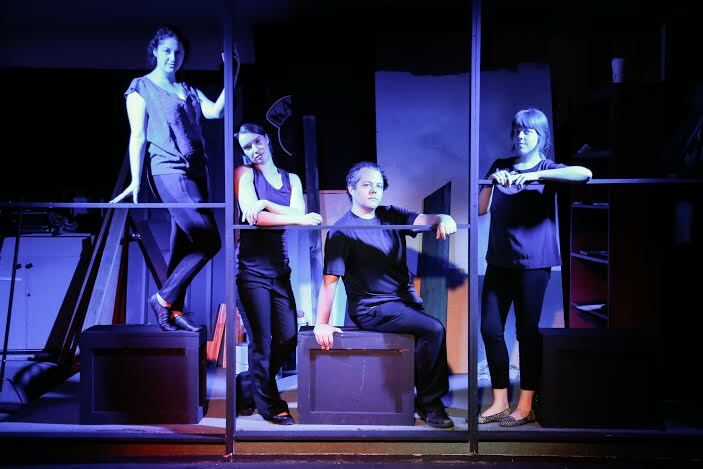 Son of Semele is a theatre group I've only reviewed once before, and felt astounded by the glory that was Our Class. I eagerly looked forward to The Dryway hoping for more of the same. This show is part of the Son of Semele's Company Creation Festival. Oh my. I felt thunderstruck. 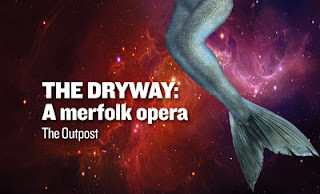 The Dryway (A merfolks opera) turned out to be a three-woman show blending song, poetry, dance and performance art into a retelling of Melusine, the medieval legend of a mermaid banished from the ocean with her two sisters, Melior and Palantyne. Although based on something from the middle ages, this hour-long performance roots itself into our sensibilities as well as a modern context. In an obvious way, when Melusine--banished to a desert city in the world of men--listens to music, it is to Johnny Cash. Likewise when their mother finally communicates to her, it is by phone. But more profoundly and subtly, we see this legend retold with a lens that includes our modern way of looking at things like forests and mountains, at identity and even death. Tellingly, it contains the tales of all three sisters not just one--and does so from their point of view. Palantyne (A'Raelle Flynn-Bolden) finds herself alone amid the brambles and wild animals of a mountain jungle, one where flesh is scratched and bitten but escape seems impossible. But she grows strong and fierce, even as she misses her sisters and the feel of water to the point of madness. She even begins to forget her name. Melior (Megan Rippey) is banished to the icy wastes of the arctic, with nothing but a frozen dead man for company. Here day can last for weeks, the sun on the ice blinding her, so she can only feel the weeks-long night when it comes. She too changes, but is not alone--for her friend the dead man keeps her company, as she does to him, even as she slowly turns blue and moves gradually more slowly in the frozen lands. Melusine (Emma Zakes Green) really does seem to be in Las Vegas, a place where the only water she can find is chemical-laden swimming pools that burn. People are drawn to her, and she makes a home for herself, finding herself feeling that strange emotion so common to land-dwellers, hope. But hope for what? If all this sounds intriguing, then I've done my job in describing the show reasonably well--but while Green's script makes for a marvelous blueprint, the cast themselves (including the author) bring it to life. The tale of three mermaids who pay a terrible price and change in unexpected ways does more than intrigue thanks to the performers. They make us feel what the three sisters endure, what they believe at first about themselves and their mother, more importantly how they make their final choice. As I wrote earlier--I was thunkerstruck. Not only because each actor showed the talent and focus to commit totally to this weird dreamlike world, but they brought each sister to life in such a way the climax--the moment of decision--seemed absolutely inevitable, courageous and tragic and utterly beautiful all at the same time. Their mother offers in the end to let them come home, to return to the soothing sea. But at a price--to forget all that has happened, to give up all they have learned and become. One only had to have heard the souls given voice in the songs and words of this play to realize their answer before any spoke one word. The Dryway (A merfolk opera) runs Saturday February 13 at 8pm, and Sunday February 14 at 5pm at 3301 Beverly Boulevard (@ Hoover) Los Angeles, CA 90004. 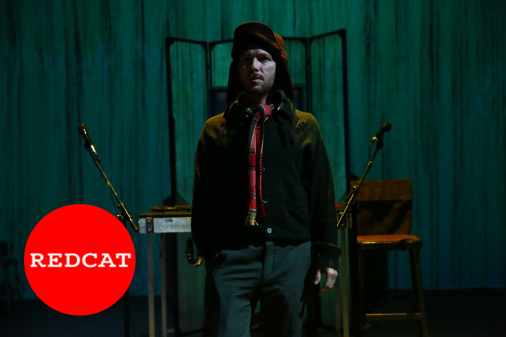 With luck the show, by a new theatre group called The Outpost, will pop up elsewhere down the line. Note: The Dryway has now been extended to include March 18, 19, and 20.